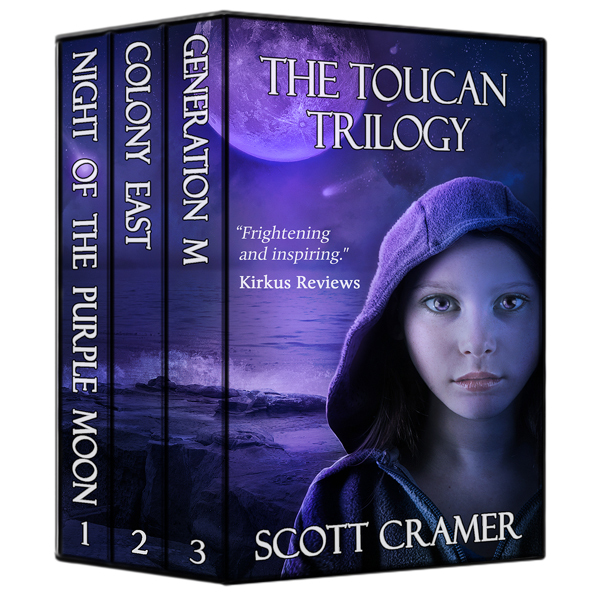 On October 17th, The Toucan Trilogy by Scott Cramer hit the number 5 spot in the Teen section for the Amazon Kindle store. While Scott has previously written feature articles for national magazines and has optioned a screenplay, these are his first novels.This dystopian trilogy consists of Night of the Purple Moon, Colony East, and Generation M.
Scott, let's start with a description of your books. This is the plot of The Toucan Trilogy: After a lethal pathogen introduced by a comet attacks the hormones of puberty, nearly all of the world’s adults die. Abby helps her brother and baby sister survive the apocalyptic nightmare, only to face the biggest threat of all: the deadly time bomb of adolescence. But this is really what the book is about, as taken from a recent reader review. “The series brings to life the beauty of being human, our capacity for both good and evil but never negating the fact that the foundation of the human race is based on love, family, determination and our need to ensure our survival. I wanted to write a story that would appeal to all ages, from 13 to 100, and I think I have largely accomplished that. I’ve received a number of emails telling me that a grandmother, mother, and daughter (three generations!) have all read the series and loved it. First, I have to say that I love paperback and hardcover books, but I love my Kindle even more. Writing is a solitary endeavor, and it’s great when you have an opportunity to interact with readers and members of the team who are responsible for helping publish the book (editors, designers, formatters, beta readers, etc.) I love the fact that I am able to communicate with readers all over the world. My designer is in Bulgaria. I have several editors across the U.S. My formatter is in Australia. Beta readers come from Portugal, Sweden, Ireland, and across the U.S. There was a recent New York Times article that said paperback books are making a comeback. I find that really hard to believe. The cost of eBooks and the simplicity of eReaders make for a winning combination. I expect eBooks will exceed print publishing over the next few years. Learn more about Scott and his books by visiting his blog, or by following him on Facebook or Twitter. See the latest Kids' EBook Bestseller List for more top ten e-format authors and their books. It's updated every Saturday. Check back next week when my featured author will be Sean Fay-Wolfe. Want a sneak preview of the rest of the authors I'm featuring? You can sign up HERE to get my newsletter and stay up to date with the blog and my books.